Saint Andrew, the brother of Saint Peter, was a fisherman by profession, and was a native of Bethsaida in Galilee. As Jesus walked by the Sea of Galilee, he saw Simon and his brother Andrew, casting a net into the lake, for they were fishermen. 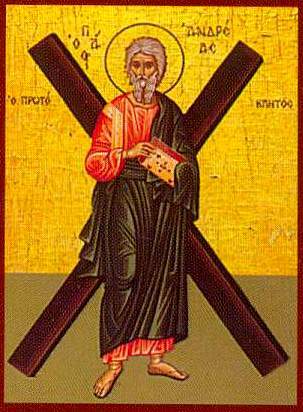 Thus Saint Andrew was one of the very first Apostles of Jesus. After the Apostles were sent to preach the Good News to the whole world, it is recorded that Andrew preached in Scythia, also in Sogdiana and Colchis. He also gave out the Good News as far away as Greece, Russia and Poland. He was martyred at Patras in Achaia in 60 AD and laid to rest in the Church of the Apostles in Constantinople, built by Constantine the Great. In 1270 when the city was taken over by the Latins, his relics were removed to Italy, and deposited in the Cathedral of Amalfi, some 35 km south east of Naples.